The iPhone Xs Max headlined this year’s launch event, Apple’s earmarked annual event. The device is the biggest iPhone ever created by the trillion dollar company, with a 6.5 in OLED display. This is also the most expensive iPhone ever made, so it definitely has high expectations that are needed to be met. The iPhone Xs Max is now one of the bulkiest smartphones in its flagship, weighing nearly 210 grams with external body dimension ranging 6.20 x 3.05 x 0.30 inches. It sports a super bright Super AMOLED/OLED display, which ensures that the users get the most vivid experience. Moreover, it has a 1242 x 2688 pixels resolution with an approximate 84.5% screen-to-body ratio, meaning that the display is better than ever. Like its sibling iPhone Xs, this variant too runs on an A12 bionic chip. It boasts the fastest processor, with a hexacore CPU. The usual 4-core graphics GPU make the iPhone around 50% more quicker. What sets this model apart from the other two is the camera. The iPhone Xs Max has a dual-lens camera, both 12MP. The primary lens has a f/1.8 aperture, whereas the second lens has a wide angle f/2.4 aperture. Both the lenses are optically stabilized, with the latter having a 2X optical zoom feature. Coming to the video shooting aspect, the iPhone Xs Max can shoot 4k videos, as well as [email protected]/30/60fps and [email protected]/60/120/240fps videos. The SmartHDR makes the well-timed photos and video look professional. The front camera, however, is the same as the other models. It has a 7MP, f/2.2 aperture, 32 mm lens, with an IR sensor. The front camera can shoot 1080p videos at 60fps. Apple finally introduced dual sims, capable of supporting two phone lines and plans. The two sim slots are nanoSIM and eSIM respectively. The device, however, won’t support 5G network, when it releases later this year. It has the up-to-date 5.0 Bluetooth feature and also supports NFC, the feature which allows you to use Apple Pay. Even though the internet was filled with rumors about Apple ditching its lightning connector, the latest version still uses the same 2.0 proprietary cable. 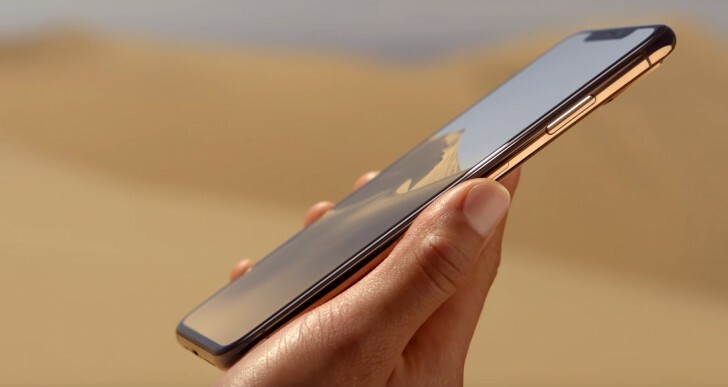 The iPhone Xs Max has all the necessary sensors, including the retina scan/Face ID, accelerometer, gyro, proximity, compass, and the barometer. Apple enticed the users by stating that this iPhone can charge up to 50% in just half an hour. It supports Qi wireless charging and will be compatible to AirPower when it releases. This iPhone would be available in the same usual colors- Space Gray, Silver, Gold. It will be available in the 64/256/512 GB storage options, all with a 4GB RAM. Those who want a large display phone with the brightest display and the best battery life of all iPhones should go for iPhone Xs Max. It ranges at the higher price bracket, with the 512GB variant costing an astonishing $1450, which not everyone will be able to afford. However, if you still can’t get your eyes off the newest model, EMI options can help you bring it home.